Large cone folds with a simple twist and slides into compact shell for handy storage. 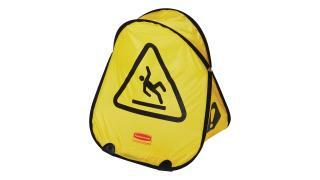 International Wet Floor Symbol communication utilizes ANSI/OSHA-compliant color and graphics. The Rubbermaid Commercial International Wet Floor Symbol Folding Safety Cone folds with a twist to fit into a compact storage shell. It is highly visible —30% more surface area than competitive fabric safety cones and is ideal for airports, amusement parks, and public bathrooms. 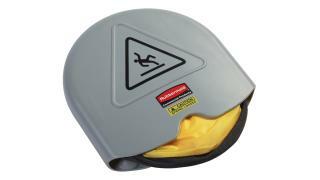 ANSI/OSHA-compliant color and graphics.